We are now accepting orders for the DODX 41000 Series Flat Car Kits, along with the decals and military style loading chains. The latter two are available separately. See this link for ordering info. You can also download a copy of the instruction manual at that page. Kits will ship next week. Military style loading chains are available separately. and a 480000 flat car. The 48000 series is a forner TTX 89-ft flat car. The production parts for the DODX car are in. I will work on the instructions and this will be ready to sell. It sure would make a great Christmas present. Here is the finished model with a M1A2 tank loaded. The tie down chains and shackles are included with the kit. The models on the back track are the pilot models made with laser cut parts. The production model uses photo etched parts with a laser cut acrylic core. Here is a close up of the car end. through traffic to the event. 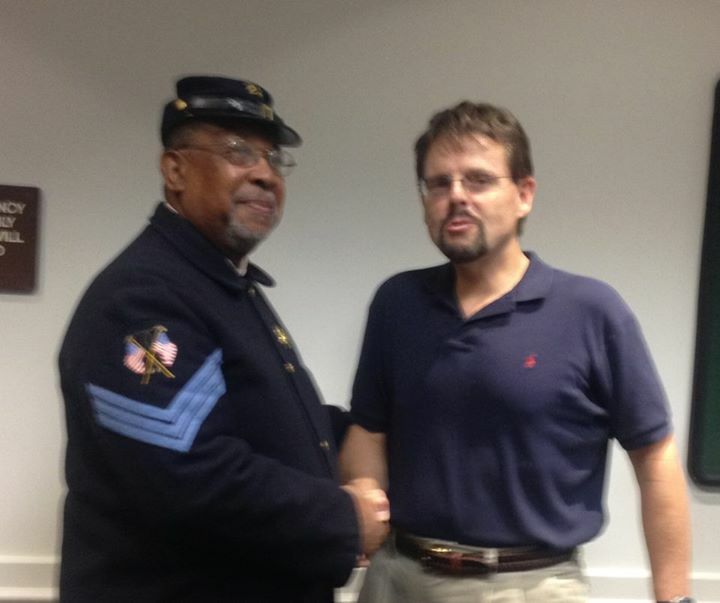 On 21 October I gave a talk about Civil War Railroads and the USMRR Aquia Line at the Stafford Public Library. The audience was quite large and very engaged. This library is in the very area that my model railroad depicts. Several of the audience members live along the route and were very familiar with it. I had a great time presenting the talk and getting their questions and feedback. One the of attendees was Hashmel Turner. He was dressed in the uniform of a Sergeant 23rd USCT, 4th Division, IX Corps. Reverend Turner is the unit Chaplain. He alerted me to the Trail to Freedom Heritage Tour that will take place on 1 November. Here is the link. If I have time am going to attend. As I have discussed in previous posts, such as this, this and this, 10,000 slaves used the Aquia Line to attain freedom. This unique reenactment will recreate some of this history from the African American perspective. The 23rd USCT is a reenactment unit from Spotsylvania County. It was one of the first USCT units to engage in direct combat, fought in the Overland Campaign and was at the Battle of the Crater. You can learn more about them here. It should be noted that at the time I am modeling, the USCT had not yet been formed. So I do not have them represented on my layout. However, we do have a unit of USCT on McCook's Landing as they were frequently assigned to guard missions as they were newly recruited to gain military experience, before being sent to direct combat. About 300,000 African Americans served in the USCT during the war. USCT Artillery unit drilling on McCook's landing. I have been super busy with my fourth book and customer models. So I don't have much layout progress to report. While I work on those, I suggest you check out John Ott's web pagehttp://www.ottgalleries.com. It is quite possibly the nicest model railroad website, period. 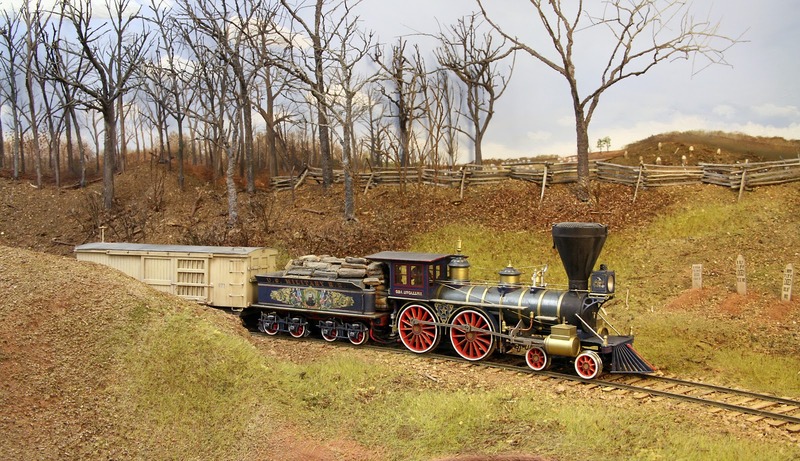 His 19th century models and layouts are incredible. 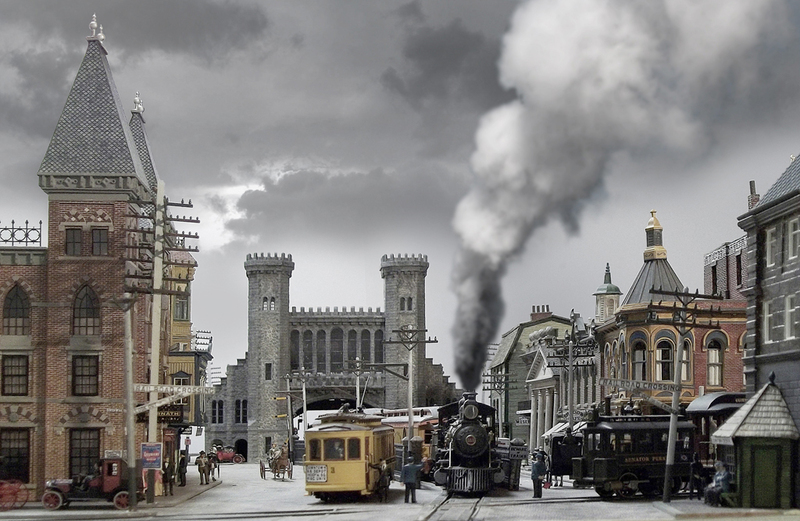 His latest project is a layout set in a dreary New England town based on the H.P. Lovecraft horror novels. Trust me, you will be slack jawed when you see this (and his earlier layouts), even if you are not a Lovecraft enthusiast (which I am not). Enjoy! After a wet round of golf today in Queenstown Harbor, AW and I stopped at the U.S. Naval Academy Museum on the way home. It had been more than 17 years since my last visit there. I had heard they did a renovation about 4 years ago, so a trip was due. Readers of my blog will know I have a strong interest in ship models. My layout will eventually house several ship models. My models will be essentially structures set in water. Though I will try to make them as accurate as possible, they will not compare to the models the Naval Academy's collection of Admiralty or Dockyard models. These were model ships built by the ship contractors of the time, probably as gifts to naval leaders they needed to impress. Since so few ships from this period survived, but several hundred models did, these are the best look we have at ship construction in the 17th and 18th centuries. have rigging, but some, as this one, does. The ship models in the Naval Academy museum came mostly from the Col Henry H. Rodgers collection. He was the son of a wealthy American oil magnate who collected ship models from antique dealers and private individuals. He bequeathed them to the Academy in 1935. He also had a collection of prisoners of war bone models, also very impressive models. For more info see this video about the museum's collection . Note the intricate carved gun ports and the female figures carved in the poop deck supports. An example of the craftsmanship, 40,000 tacks used to copper plate the hull of HMS Minerva. The museum also has a nice collection of other ship models, though their collection of ACW era ships are somewhat sparse. The USS Syren, a fine looking brig. A frequent topic for discussion among ACW RR modelers is how much weathering should we apply to our models. I believe the answer is, as always, it depends. 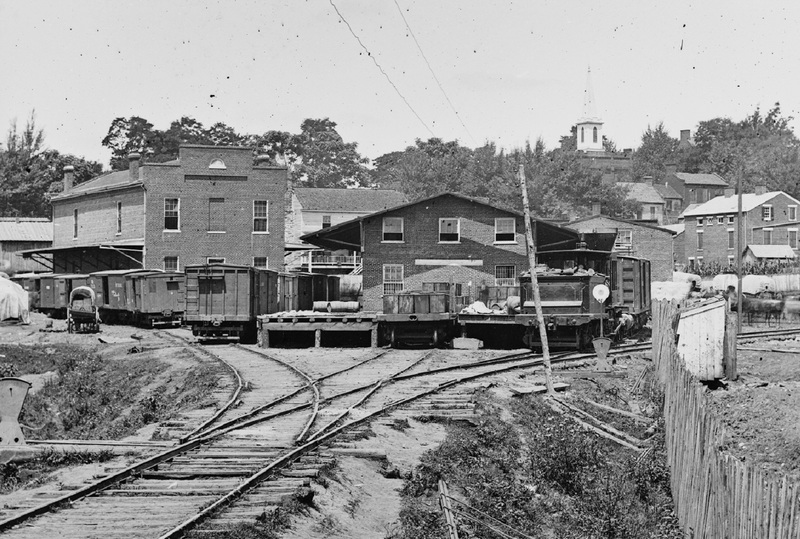 Freight cars and structures are no different than today. The older the structure, the more it should be weathered. Locomotives are a special case. On my layout, most of the structures are newly built by the USMRR, so I need to go easy on the weathering. But I have some older buildings that I can add more weathering, such as the water mill. Freight cars were made mostly of wood. Furthermore, their paints and stains were not as long lasting as today's. 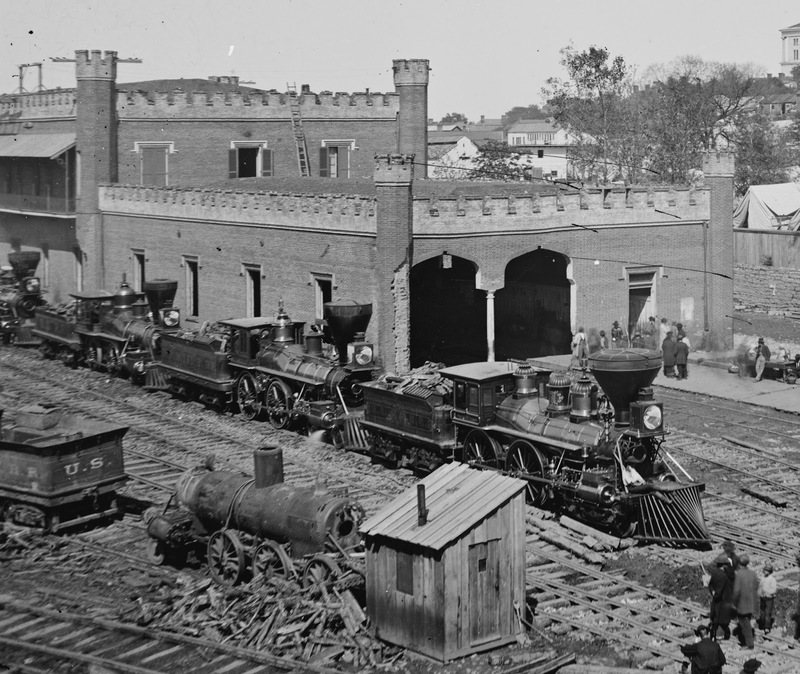 In the civil war the cars experienced hard service. They should show signs of weathering. In some cases battle damage or vandalism by soldiers should also be depicted. 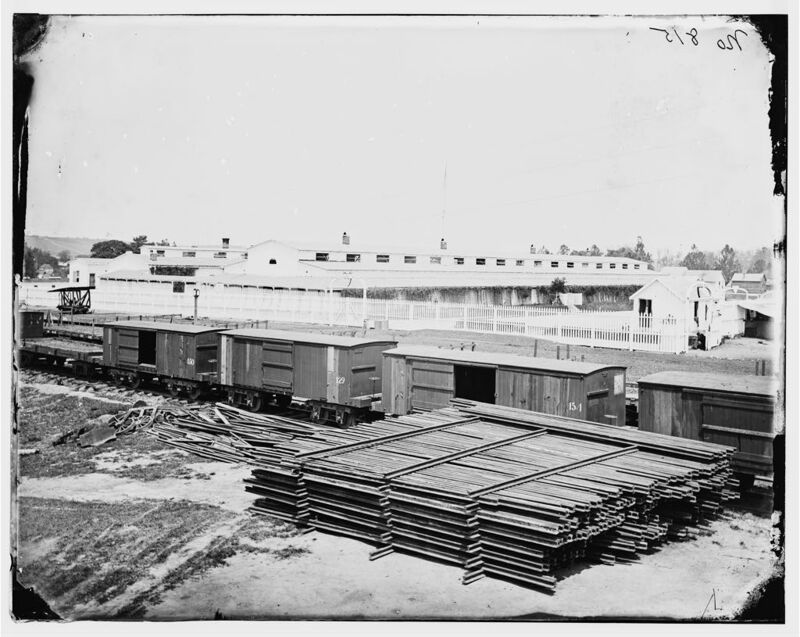 Soldiers were known to “ventilate” box cars using their bayonets or spades during transport. 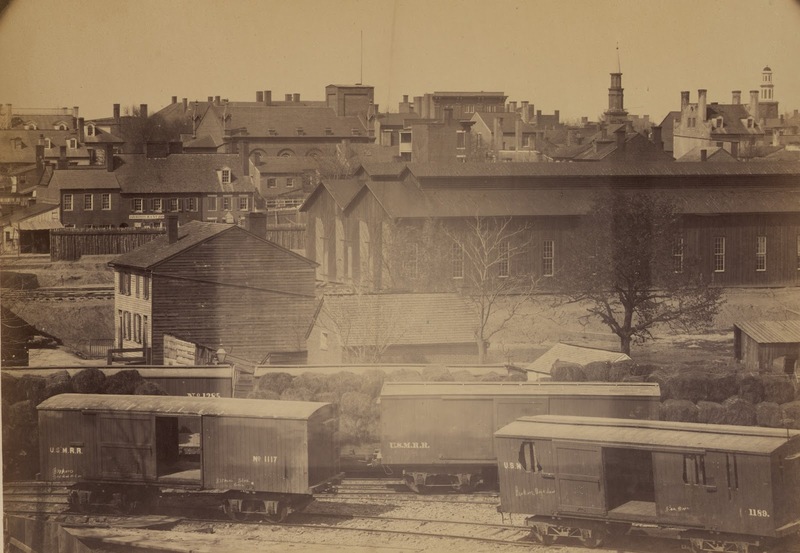 Notice the cars in this photo at Alexandria. Some shows signs of having boards taken out by soldiers. Note the wear onthe roof of the car onthe left without the roof walk. The roofing material seams are very visible. In this photo even these recently repaired freight cars show extensive weathering. The foreground car has had some of its sheathing replaced. The locomotives were a different story. 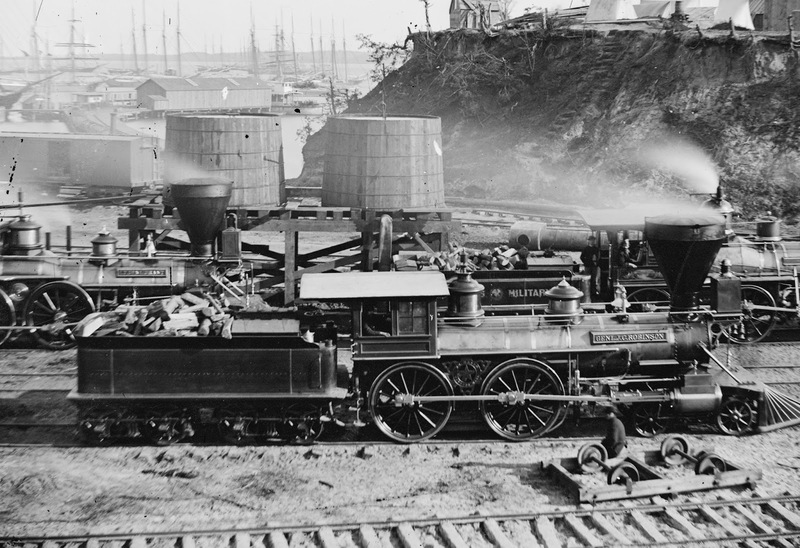 In the 1860s locomotives represented the highest in technology. The owners were proud of their machines. They had numerous brass parts, colorful paint and gold leaf lettering - that is part of their charm. Nonetheless, they saw hard service over rough, dusty or muddy track. The engines mostly burned wood, some of it quite green, and thereby were exposed to lots of sticky soot. Although engines in service were well cared for by crews, they still showed signs of being in use. I look to prototype pictures for hints on how to weather. The tender of this engine shows signs of dust and soot. This photo shows the depot at Warrenton, VA during a time when the USMRR operated there. Note the dilapidated fence and the weeds growing along the embankment. BTW these are amazing photos loaded with detail. I suggest you follow the links and look at the high resolution .tif files to examine all the detail in these prints from 8x10 negatives. This engine shows streaks on the smoke box. The brass boiler bands have dust or soot accumulated against them. The walkway has scuffing. The smoke stack is sooty. The cab roof shows some textures, possibly waterproofing sheets. The vertical surfaces of the tender are dusty. But most of the brass is shiny. Also note that the water tanks are brand new looking, with no signs of water seeping despite full tanks. Another shot, this one from Nashville, shows the in-service locos with sooty smoke stacks. The cab roofs are dusty and show stains. The tenders look dusty. The top of light box looks dusty. Yet, the brass is gleaming. On the other hand, the rusty hulk in the foreground is quite weathered. The tender to the left is also looking dusty and weathered. When looking at modern replica locomotives one needs to be aware that the boilers are not made from Russia iron. Instead they are painted to look like Russia iron. The weathering treatment may vary depending on the effect you are looking for. The other factor to consider is the "scale effect" on colors. If you never heard of it see this link for an explanation, or google scale effect on color. I don't believe you can use fixed formulas to achieve the scale effect, you should use your own judgment in implementing it. But you should definitely consider it when painting a model. As part of the scale effect, at a minimum you should dullcote your models, including those that are right out of the factory. Even if the prototype used high gloss paint, in scale it should not look as glossy. Nothing makes a model say “toy” than a full gloss paint job. I dullcote all my scale models, taking care to cover all glass I want to look transparent. For my well maintained locomotives, I tend to go easy on the weathering. After dull coating, I apply chalk dust to the smoke stack and smoke box, cab roof, and tenders. I add black wash to the crevices, but then wipe most of it away. Then I add streaks to the smoke box, and oil stains to the journals. My freight cars get a heavier weathering treatment. My latest book is at the printers. It should be released by 1 January, but if you pre-order it you may get it in time for Christmas. There is frequently crossover among the modeling hobbies, both in techniques and the people that practice them. This is a tale of such a nexus. I read several armor and ship modeling magazines. I occasionally look at radio controlled (RC) armor, ship, and airplane websites to see what they are up to. That is where I first learned how battery power is revolutionizing their hobbies and its spill over to RC trains. However, I was unaware of the large scale (RC) square rigged ship modeling hobby until my friend, Brian Kammerer, started sending me emails about the model he was building. Brian is the fellow who helped me with the camp scenes for my backdrops. He is famous for his animated movie called , "The Other Great Locomotive Chase." The image at the left is the ship Brian built last summer, a four foot long model of the HMS Surprise. The hull is plastic extruded foam covered in vinyl siding and putty. He used an RC motor boat inside for power. The sails and rigging do not work... actually that is not true. Lets say they work, but not in a way that allows one to actually sail. They do catch wind and move the ship! The most amazing thing is that Brian built this ship model with scraps, odds and ends, and craft store supplies. It is an incredible demonstration of scratch building. I helped in a tiny way by laser cutting some detail parts like the windows and the bowsprit. Here is a link to a forum with more photos. Once he had his ship done, he connected with Ray Grosser, a name familiar to many model railroaders. He and his wife are serious model railroad enthusiasts with several amazing layouts on their resumes. But, Ray was also a serious RC ship sailing hobbyist. Here is a sample of Ray's 1/24th scale HMS Surprise sailing in brisk wind. It really is amazing. 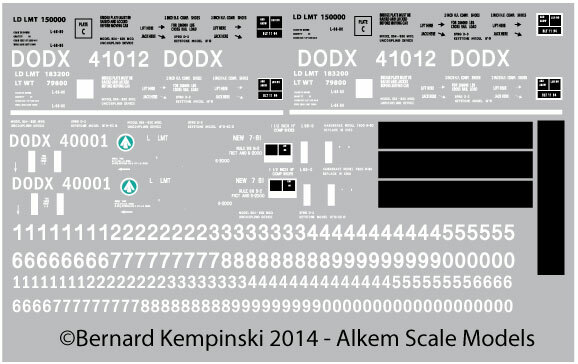 I have several ship models planned for my layout, but they are going to be static models. Basically they are structures that happen to rest on water. But when you see these ships in their moving in their intended element, it is much more interesting and exciting. Perhaps this will be my next hobby once the layout is done?